What meals you serve will highly depend on your kitchen equipment. The better you are equipped, the better one can cook. There are certain things that you always needed. These include primarily pots, pans and knives. Also, crockery and cutlery should always be at hand. In a well-equipped cottage, cutlery and crockery will already be there. While trekking or on camps each participant has to bring his own. – Whatever the kids need to bring to the camp must be communicated to the parents well ahead of the camp. As mentioned above, the kitchen equipment at the campsite is very simple. Besides the campfire, there is most likely nothing more to go by then two gas cookers. Therefore, all meals should be rather simple. 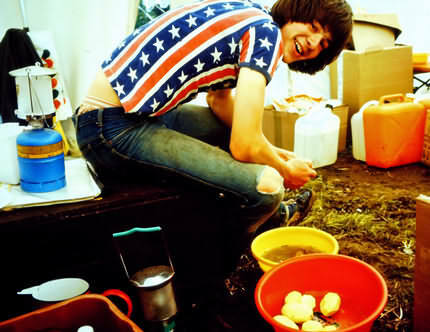 Of course, it is possible to prepare stock bread, fish and sausages and grill them over the open fire. In most cases, however, you will resort to getting your food from cans because there is no opportunity to prepare elaborate meals. And it only gets more difficult, if you have to cook for many people. Therefore, the advantage with camping is, that you can do it anywhere as long as you are prepared to adjust your culinary needs. To avoid having to give up anything even when camping, inform yourself well ahead if it is allowed to bring either a charcoal grill or gas grill. The greater the range of cooking facilities is, the more extensive and versatile are the dishes that you can prepare. Of course, you can always prepare food from cans. Usually, that is the easiest way anyway. Who also can grill, also can prepare various meat dishes on the grill. Even vegetables can be cooked on the grill without any problems. 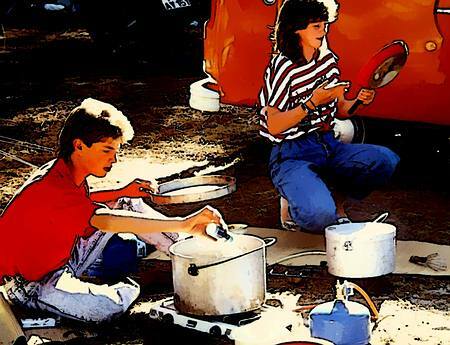 The basic gear you will need to bring to just about every camping trip are soup bowls, dishes and maybe one more plate for a dessert, cups and glasses. Further, but you will need a bread- and a meat knife and fork, knife and spoon. Also, you need a pot and a pan, or perhaps a barbeque utensils. Whenever possible use plastic plates, cups and glasses. This will lessen the possibility of something to break. You certainly do not need any more stress. Dishes made of melamine are versatile and can do magic on the smallest table and will also bring some colour to the meals. Besides, they are easy to clean and dry well. Also, don’t forget to bring some garbage bags. That will keep everything clean and saves from running to the bin every 5 minutes. You can quickly collect all the leftovers with a garbage bag and carry it over to the bin at the end of the day. Preparing the kitchen depends greatly on the length of the trip and your general cooking habits. As a rule, when camping in a caravan, you would go about it by the things you have at home in your kitchen cupboard. Here again, you will need several dishes and plates and a dessert plate, just in case. Cups, a container for butter, bowls und glasses, an egg cup and spoon, maybe even an egg pricker. Most likely you would not bring your expensive china and instead, resort to plastic cups and glasses. There is a great choice these days when it comes to buying camping gear. Moreover, the risk of breaking something is reduced. Furthermore, one needs different knives. For example, bread knife, meat knife, a knife for fruit and vegetables, scissors, wooden spoon, spatula, whisk and masher for purée. Kitchen facilities also include ladles, a grater for vegetables with various inserts, a can opener, optionally is the corkscrew, bottle opener and cutting boards. The more cutting boards you take, the more people can help with the cooking. You also will need a strainer, a lemon squeezer various plastic bowls and a large pan with a lid, as well as a set of various sized smaller pans. If you bring a charcoal or gas grill don’t forget to bring grill tools as well. The little everyday helpers in the kitchen are a necessity as well. Although they are often taken for granted, they do make things a lot easier. These include a measuring cup, pot holders, salt and pepper shakers as well as plastic containers for storage. Important are also coffee filters and coffee pot, maybe even a coffee maker, tea filters and teapot, a thermos, a kettle, lighter, matches, gas lighters, one to two larger bowls with accessories to clean the dishes and a kitchen roll. Also important are chairs, deck chairs, tables as well as garbage bags and plastic wrap. Last but not least you need aluminium and plastic wrap, also a sewing kit, shoe cleaning kit; soap or a hand sanitizer, washing lines and pegs. Besides the cooking facilities in the caravan and the charcoal or electric grill, it is always possible to additionally carry a stove-top or gas cooker with you. Although that sounds like a lot of things you should never forget that the one with the best kitchen equipment can also cook the best. Whether you are travelling with your family or with a group of teenagers, it is always possible to prepare tasty food for all and have fun at the same time. Of course, the circumstances are different, but human beings are known to grow to meet new challenges. Therefore, it is important to take those challenges on and make them work for you. If you have rented a house, to spend leisure time with young people, most likely you have the advantage of using the kitchen equipment, which is already there. There will be everything, beginning from the teaspoon to the big pan. From home, you are used to having everything handy. This all looks quite different, if you have to bring you own kitchen stuff along. Because then begins the great planning. The better kitchen equipment, the better the cooking and therefore, the tastier the food. Most kitchens are equipped with an electric or a gas stove. To cook and to be able to enjoy it as well, first of all, you will need cups and plates in various sizes, bowls for salad or dessert but also egg cups egg spoon, spoons, forks and knives. In addition, you need salad bowls, measuring cups and mixing bowls of different sizes. Furthermore, you also need butter containers, cutting boards, meat and bread knife and a spatula, whisk and different sized sieves. A coffee maker and a coffee pot with coffee filters, and a teapot with tea filter are always needed. Depending on your to cooking style, you will also need a lemon squeezer. Moreover, ingredients and leftovers are best kept in plastic containers or bulk cans. In order to cook properly, you will also need different sized pots and pans, and possibly also an egg cooker. A toaster can be important on a recreational basis. You should also bring flour and sugar in well-labelled containers. Salt and pepper are best kept in jars or pepper mills. Other spices are usually available in appropriate spreaders. In this way, they can be measured the best. The better and the more detailed your kitchen is, the better you can cook. In addition, you will feel safer the better you are prepared. However, equally important is to make sure whoever the helpers in the kitchen are, nobody gets hurt. Check everything in the kitchen to make sure all are safe. This includes blades and knives as well. Everyone involved in kitchen duty is not just responsible for his own safety but for the safety of everyone as well. It is, therefore, impotent to check everything and then check once again. Injuries are not only from knives but from glasses and plates alike. If a corner is broken, throw it out to be on the safe side. One of the most pressing questions regarding the kitchen is the transport and storage of food. Food must be stored hygienically and possibly cooled. It also has to be protected against mice and other pests. Therefore, comprehensive and well-lockable storage boxes are needed. Already when you are packing, make sure that you pack the food in a way, that it either visible or well labelled. That way you will find it quickly, and everything is handier. Keep in mind, food which requires a fridge have to be kept chilled during the transport. Plastic containers are best for butter, sausages, bread and cheese; but also for vegetables. Cans and similar stuff are best transported in large metal or wooden crates. Always make sure, that the transport container was well cleaned beforehand. If you want to keep groceries cool by means of digging them into the ground or keeping them in the water, you will also need water- and airtight containers. For all the foods requiring a fridge, you will need additional ice packs; particularly when there is a long transport time. If you do not have them, frozen plastic water bottles will do as well. This will keep your foods fresh and cool until you can put them in a fridge again. 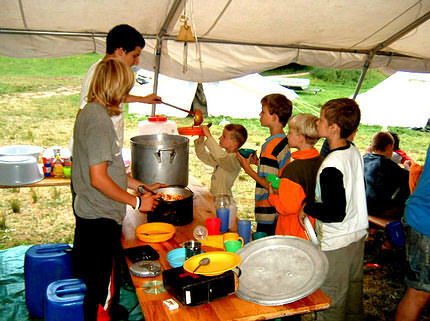 Before you even go on the trip or the camp, it is advisable to check out the kitchen first. Take notes what is already there and what you will need to bring. Also, check out, which kind of cooking facilities is available. It would be annoying to plan a menu only to find out the necessary facilities are not available. When hiking, or camping check pots, gas stove and utensils to make sure they are all working and if necessary replace what is not up to scratch.